Doctor Ashburn: Sore Throat, Cough, or Fever? If you’ve caught something that is leaving you sweating, coughing, or your throat raw, then you may need treatment to get back on your feet. You may also be confused about the exact issue at hand. Here at Virginia Premium Medical Care, we can take a look at your symptoms to assess the true issue at hand, and we’ll provide you with a treatment plan as necessary, so that you can get over this temporary setback. We’ve also cataloged a few symptoms and their potential sources, so that you can assess where you’re at, and what you can do to get better**. If you’re still uncertain about what ails you, just reach out to us for an appointment! A sore throat may be a symptom that comes alongside a variety of ailments. If you’re suffering from strep throat, the common cold, tonsillitis, or an upper respiratory infection — among other illnesses — then you may experience soreness and swelling in your throat. You may also be experiencing an allergic reaction to something, if your throat is swelling suddenly — you should seek treatment immediately if the swelling is aggressive. If you are suffering from strep throat, your throat may become painful rather quickly. It can prove difficult to swallow, and you may notice that your tonsils are swollen. If you inspect the inside of your mouth, you may notice patches of white on top of your tonsils, and/or small red spots on the roof at the back of the mouth, near the throat. You may also have a fever. If you are suffering from the common cold, then you may also experience coughing, a runny or stuffy nose, a slight fever, and some general aches and pains throughout the body, headaches, among other symptoms. Usually, throat soreness is relatively mild for those who are suffering from a sore throat (in comparison with other illnesses, like strep throat). If you are suffering from tonsilitis, your tonsils will be swollen, and they may be redder than usual. In addition, you may have white or yellow streaks and patches on the surface of your tonsils. It may prove painful to swallow, and you may have a fever. You may also have swollen lymph glands throughout your neck. It may also be difficult to talk. If you have an upper respiratory infection, then you may experience a sore throat as well as sinus pain, nasal congestion, fatigue, a fever, coughing, and wheezing. If you’re experiencing any of the aforementioned symptoms alongside your sore throat, and you can’t pinpoint the issue at hand or you need treatment for your ailment, then we can help. Count on Virginia Premium Medical Care for a check-up and a treatment plan. You can schedule an appointment right away, or feel free to stop by the clinic for a walk-in appointment during our normal open hours. If you’re coughing during an illness, you may have a variety of ailments, including the common cold, a respiratory infection, bronchitis, asthma, allergies, or another illness. Those who are suffering from the common cold, respiratory infections, asthma, and bronchitis may cough up phlegm, which can build up in the throat and respiratory passageways. Phlegm buildup is less common for allergies. Bronchitis may occur after a flu or cold, and it is often marked by phlegm buildup in the throat and respiratory passageways. You can try drinking fluids, consuming lozenges or cough drops, or using a vaporizing treatment to reduce your cough — be sure to follow the directions listed on products intended to treat a cough. 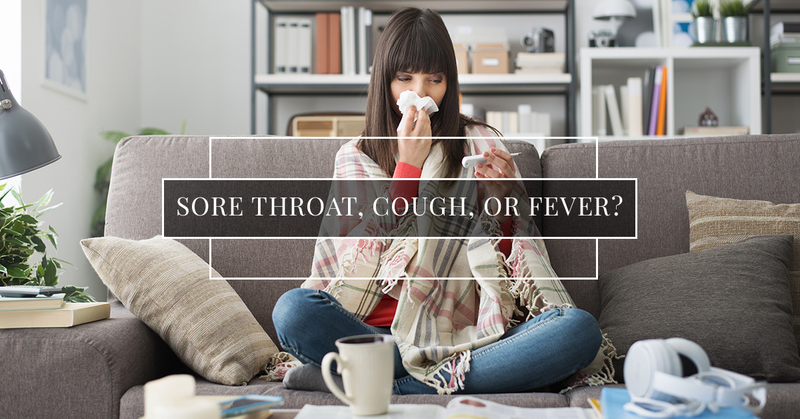 If your cough is persistent it may be time to get medical attention. If your temperature is spiking, then you may be suffering from any of the following illnesses: the flu, stomach flu, strep throat, or tonsillitis — among other ailments. As we mentioned, if you suffer from strep throat or tonsillitis it’s likely that you will have a sore throat, as well as the symptoms that we mentioned above in the section entitled Sore Throat Causes. You can read more about common symptoms for those illnesses above. In addition, you may have the flu or stomach flu if you’re experiencing a fever. If you’re suffering from the flu, then you may have aches and pains throughout the body. Your body may also feel fatigued, and you may sweat due to the fever. You may not be hungry, or you may be dehydrated. In addition, you may experience a cough, pressure in the chest, nasal congestion and head congestion, headaches, and nausea. The flu can affect much of the body, which can prove painful. Have your temperature monitored to make sure that it doesn’t reach a dangerous level. See medical treatment if your temperature reaches 103 degrees Fahrenheit (for adults) or 100 degrees for infants — you can see fever temperature guidelines and recommendations from the Mayo Clinic. Those who are suffering from the stomach flu may have a fever, as well as a variety of digestive issues. On top of a fever, you may experience abdominal pain and cramping, as well as diarrhea, vomiting, nausea, and gas. You may also feel dehydrated, fatigued, lightheaded, and may experience loss of appetite. You may lose weight, feel weak, and have an increased heart rate. Headaches are also common. Again, seek medical attention if your fever reaches a point mentioned in the guidelines above. Here at Virginia Primary Care, your health is our priority. When you’re suffering from a sore throat, cough, or fever (or any other ailment), we’ll do our utmost to get you back to health. Stop into the clinic for check-ups and treatment. We provide general medical care services for a variety of common illnesses and injuries, and we’d be happy to help you get back on your feet. Schedule an appointment, or stop by the clinic during our hours of operation for a walk-in appointment.